XLR8 Triple Fan Cooler; game faster, game silent. Enjoy your supercharged gaming experience with PNY GTX 1070 XLR8 Gaming Overclocked Edition. Powered by the new NVIDIA® Pascal™ architecture and optimized with PNY’s XLR8 Triple Fan XLR8 Cooler; Now you can game faster, game silent. 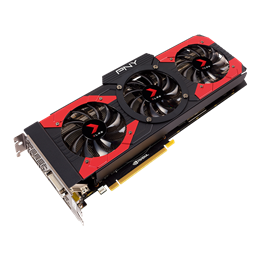 This advanced graphics card is created with ultra-fast FinFET technology and supports DirectX 12 features to deliver fast, smooth, power-efficient gaming experiences.